Statue of Trim with Flinders, in Donington, Lincolnshire, Flinders' birthplace. Trim. Flinders' faithful boat cat. Port Lincoln, South Australia. Trim was born in 1799 aboard the ship HMS Reliance on a voyage from the Cape of Good Hope to Botany Bay. The kitten fell overboard, but managed to swim back to the vessel and climb aboard by scaling a rope; taking note of his strong survival instinct and intelligence, Flinders and the crew made him their favourite. Trim sailed with Flinders on HMS Investigator on his voyage of circumnavigation around the Australian mainland and survived the shipwreck of the HMS Porpoise on Wreck Reef in 1803. When Flinders was accused of spying and imprisoned by the French in Mauritius on his return voyage to England, Trim shared his captivity until his unexplained disappearance, which Flinders attributed to his having been stolen and eaten by a hungry slave. Trim was a bicolour cat, being black with white paws, chin and chest. He was named after the butler in Laurence Sterne's Tristram Shandy, because Flinders considered him to be a faithful and affectionate friend. During his imprisonment, Flinders wrote a biographical tribute to Trim in which he described him as "one of the finest animals I ever saw... [his] robe was a clear jet black, with the exception of his four feet, which seemed to have been dipped in snow and his under lip, which rivaled them in whiteness. He had also a white star on his breast." Flinders wrote of Trim while still captive on the Isle de France in 1809. In 1996, a bronze statue of Trim by sculptor John Cornwell was erected on a window ledge of the Mitchell Library in Sydney, directly behind a statue of his owner that was erected following the donation of Flinders' personal papers to the Library by his grandson in 1925. The popularity of the statue has since led to the development of a range of Trim merchandise by the State Library of New South Wales. The Library's cafe is also named after the cat. which is a part of the epitaph that Flinders had promised Trim. Trim also features on the first statue of Flinders to be erected in England, which can be found in Donington, Lincolnshire, the birthplace of Flinders. There is also a statue of Trim at the foot of his person, Flinders, in Port Lincoln, South Australia. The exact same statue is also at the Flinders University campus in Adelaide, South Australia. In addition, a large bronze statue of Matthew and Trim stands at Euston Railway Station in London. 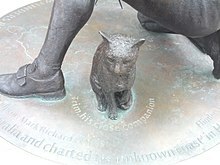 In Australian author Bryce Courtenay's novel, Matthew Flinders' Cat, both the cat and the library statue feature as major characters. Courtenay, Bryce (2002). 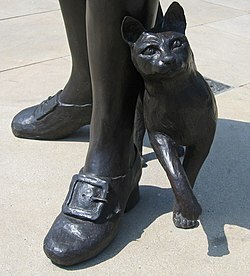 Matthew Flinders' Cat. New York: Viking. ISBN 0-670-91061-9. Flinders, Matthew (1977). Trim: Being the True Story of a Brave Seafaring Cat. London: Collins. ISBN 0-00-185028-8. ^ Rebekah Higgitt. "Matthew Flinders bicentenary: statue unveiled to the most famous navigator you've probably never heard of | Rebekah Higgitt | Science". The Guardian. Retrieved 11 February 2017. ^ a b c "FLI/11 Matthew Flinders' biographical tribute to his cat Trim 1809 (FLI11) Page 1". flinders.rmg.co.uk. National Maritime Museum. Retrieved 24 August 2018. ^ "FLI/11 Matthew Flinders' biographical tribute to his cat Trim 1809 (FLI11) Page 6". flinders.rmg.co.uk. National Maritime Museum. Retrieved 24 August 2018. ^ a b "FLI/11 Matthew Flinders' biographical tribute to his cat Trim 1809 (FLI11) Page 7". flinders.rmg.co.uk. National Maritime Museum. Retrieved 24 August 2018. ^ "Matthew Flinders (1774-1814)". Slsa.sa.gov.au. Retrieved 11 February 2017. ^ Matthew Flinders (26 April 2012). Terra Australis: Matthew Flinders' Great Adventures in the Circumnavigattion of Australia. Text Publishing Company. pp. 30–. ISBN 978-1-921922-40-4. 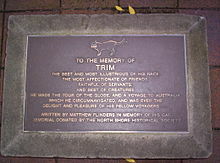 ^ "Biographical tribute to Trim the Cat, by Matthew Flinders, Isle de France Dec 1809". collections.rmg.co.uk. Royal Museums Greenwich. Retrieved 24 August 2018. ^ "Gifts: Trim - Matthew Flinders cat". sl.nsw.gov.au. State Library of New South Wales. Retrieved 24 August 2018. ^ "State Library of NSW". lonelyplanet.com. Lonely Planet. Retrieved 24 August 2018. ^ "The Flinders Papers: FLI/11 Matthew Flinders' biographical tribute to his cat Trim 1809 (FLI11) Page 8". flinders.rmg.co.uk. National Maritime Museum. Retrieved 24 August 2018.
Review of "Matthew Flinders' Cat"